We've observed water on Ceres. The largest object in the asteroid belt, you may remember Ceres as the round, rock-ice body that was considered for reclassification as a planet in the midst of Pluto's demotion. Astronomers observed the water in the form of vapor plumes, possibly issuing from volcano-like geysers on the dwarf planet's surface. Scientists have suspected that there is a substantial amount of water on Ceres for about 30 years. A study found hints of water in the form of hydroxide, a product of water's dissociation, on Ceres in 1991, but the finding wasn't confirmed by later observations. Now, Küppers and his colleagues have confirmed the finding. The researchers used the Herschel Space Observatory's spectrometer to look for signals of water. Clouds of water vapor around Ceres absorbed the heat that radiates from the dwarf planet, which Herschel's instrument detected. The team found that Ceres produces about 2×10^26 molecules, or 13 lbs. (6 kilograms), of water vapor per second from its surface. One possible source of the water is icy volcanism. "It is like volcanism in that hot material from the interior is 'spat out' to the surface," Küppers said — much like a geyser. But these icy volcanoes eject water vapor instead of molten rock, he said. Another possibility is that ice near the surface of Ceres sublimes, or goes directly from a solid to a gas, dragging with it dust from the surface and exposing more ice. A similar process occurs on comets. 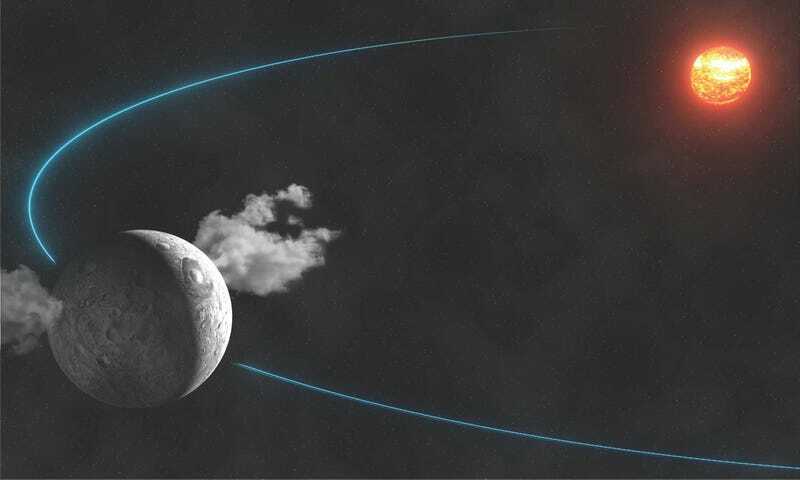 Scientists will get a closer look at Ceres next year, when NASA's Dawn spacecraft (which spent a year orbiting Vesta, the second-largest object in Earth's asteroid belt, between 2011 and 2012) goes into orbit around the big, watery rock.